Another BEST from Doggie Design! Posted On 05/17/18 by Lauretta B from Bella Vista , AR Yes, Lauretta B recommends this product! Love this! I’ve had this color combo before and wore it out! 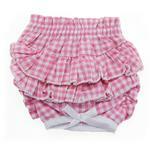 Love the pink/white gingham check, ruffles and bow! XS fits my 5lb yorkie very well! Posted On 11/20/16 by DeAwna B from Little Rock, AR Yes, DeAwna B recommends this product! Posted On 06/30/16 by Alicia R from , Yes, Alicia R recommends this product! Very cute, great quality. True to size. Posted On 06/14/16 by MICHELLE F from SAINT CHARLES, MO Yes, MICHELLE F recommends this product! Posted On 09/24/15 by Bette G from Brandon, FL Yes, Bette G recommends this product! So o o cute, Now when we go out, my old little girl will have some dignity! Posted On 08/08/15 by Kathy R from Floral Park, NY Yes, Kathy R recommends this product! The fit on these (I chose large for the pounds - 17 to 30) are a bit deceiving if you have a little chunky senior dog like we have. Kelly is 22 pounds but very small and broad. They fit ...just barely...and cover what they need to but if I had to order another I'd get the next size up to compare. Also these are all cotton so if you are looking for 'wetness protection' they will definitely need pads which again adds to the bulk and sizing issue. Made VERY well though and look so cute on our old girl. So far they do the trick and are what we needed to save the washing on her dog bed. . . Excellent customer service. They called me when I posted that I had a small problem placing the initial order. They fixed my problem and were so nice. I am so happy with BaxterBoo.